Please can anyone tell me if a front brake calliper from a 1982 will fit a 1981 GL1100? The double cylinder set up just seems so much more efficient. Many thanks. Once again, my heartfelt thanks to AdminWing and this site for very clear info. Now I have to wait for above freezing temps,like60s or 70s to do this rebuild. Thanks again! RudyPerme wrote: Once again, my heartfelt thanks to AdminWing and this site for very clear info. Now I have to wait for above freezing temps,like60s or 70s to do this rebuild. Thanks again! It is one of the BEST site out there. High quality men and women willing to help out with their talent, knowledge and time, for free!! But in Michigan, above freezing is 33 degrees. Is it because Ohio is further south that the above freezing temp is different? dpmaughan wrote: Please can anyone tell me if a front brake calliper from a 1982 will fit a 1981 GL1100? The double cylinder set up just seems so much more efficient. Many thanks. I think I saw a post about this question. I'm going to do a search and see if I can find it for you. But I think it would take a lot of modification for that to work. I think it would take bolting on a master designed for duel cylinders. Two years since anyone referenced this thread. It's a good one, tho, and I learned a couple things having never worked on 1100 brakes before. The detailed instructions at the top are spot on. I, too, was surprised to see different sized pistons between left (larger) and right (smaller) pistons. Also surprised to see the L/F and rear caliper appear to be identical. Ah, well, such is Honda engineering. The dust seals on all four large pistons were shot, but all the fluid seals look good. I'll reuse them until the next pad replacement. Searched for the seal kit mentioned in the first post but the company which had them appears to no longer carry them. Ordering individual pieces from Bike Bandit instead. Gotta say, this job really needed done. The crud in the dust seal grooves was as heavy as I've ever seen. Thanks for the great tutorial... No need to add pics, mine looked just like post #1. I did set up on the tail gate of my ol' Ford pickup, tho, as the current tiny garage is already too crowded. Beautiful day in Southern Indiana. Great How To Article on rebuilding the brake calipers. Great article on front caliper renew. It applied to my rear also since its the same caliper. Had a hell of a time trying to figure how to get the pistons out. Brakes had no love for a decade. Saw "thomascomcast" article using grease gun so I tried it. Already had a gun in the garage. Unscrewed the end and it fit perfect in the banjo fitting hole. Left the bleeder in and pumped it up and the piston came out very easy. Did all 3 calipers like that. Thanks for the tip, it was hurting my head trying to get out. Great forum !!! Thanks to everyone for the articles and tips. 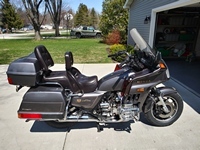 81 Goldwing GL1100I. Okay. So today I attempted to rebuild my front calipers. All went pretty well until I got to the seals. Getting them in and nice and even and such, was a little rough. Getting the positions in was a major problem. I ended up using the small tub of lube that came with the rebuild kit. I then used a clamp to push the pistons in. I just could not get them past the first seal. I did end up messing up one of the top seals trying to get the piston back in. Would I be able to reuse one of the old seals? If the seal is in decent shape and I clean it up real good? Johnny grey.......Did you watch the 3 videos I posted by brakecrafters? You should not have had a big problem getting the pistons back in past the new seals. 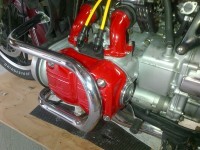 Did you apply a bit of the red grease to the new seals, and thoroughly clean the chrome pistons? I also apply a bit of light oil on the pistons before pushing them in....to reduce the friction going past the ORings. Gotta be sure you are pushing the piston in absolutely flat so it does not grab the ORing. Also, did you use a little pick to thoroughly clean out the area where the new ORings fit into? Yes I did all of that. The red grease made it a lot easier. The pistons did go in a little woonky but did even out and slid right in after messing with them for awhile. I polished the positions and the pivot bolt. Have to do the left side next. Just ran out of time today. I took brake cleaner and a pick to clean out the grooves. The step by step was so detailed. The pictures and everything are so great. I think the left side will be easier. Thank you for all the advice and help. Greatly appreciated. Johnny.....10-4.....good luck with the rest of the brake work. 11 months since my post in this thread. GLoria has seen some duty but not a lot, less than 3000miles. Rode up to Aurora, IL yesterday. Part way started getting noises from the front brakes. Found this morning metal to metal on the left side pads. Local Honda shop had pair of EBC HH PADS, $47. Yeah, I bought'em. What are ya gonna do? Google finds full sets of no name pads for~$20. Ah, well, so it goes. Need heated grips on this old girl. Query: the left front applied alone seems to have minimal braking, pushing the pedal (rear + right front) works fine. Any comments? Cattmando wrote: Need heated grips on this old girl. My '82 doesn't have the dual brake syster you have but a friend of mine has one that does, and I've ridden it. I began to ride old school with dirt bikes and then street bike, now cruisers. I always like the control of not having front brakes applied at times. I guess the rear+right front is some sort of added safety feature, and not a terrible thing. But I like more control than that offers. But I digress, when I rode my buddy's bike, I did notice a big difference between the braking force of mine (both front on with front brake lever) and his. Left only on with lever. I imagine it is because when you apply the front only, there is 1/2 the braking friction as when you apply the pedal which activates rear and right front. Just my experience. One thing I can tell you about keeping my hands warm. My '82 can't supply enough voltage to have heated anything, without compromising my charging system. 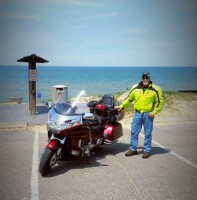 I do like to ride as soon and long as possible and in Michigan the weather can be pretty cool at times and the fairing doesn't keep much wind off of my hands. So I use my Ruff Hewen reusable hand warmers that I use when deer hunting. When I ride when it's cold I insert them into oversize gloves on the back side. It helps. They are easy to carry and activate. Boil em in water for a bit after you've used em and they are ready to use again. I got mine at Dunham's for about $6. Been using them around 7 years and they still work great. This is a cool website with a number of interesting articles on different components of brakes. patbrandon1 wrote: One thing I can tell you about keeping my hands warm. My '82 can't supply enough voltage to have heated anything, without compromising my charging system. I do like to ride as soon and long as possible and in Michigan the weather can be pretty cool at times and the fairing doesn't keep much wind off of my hands. So I use my Ruff Hewen reusable hand warmers that I use when deer hunting. When I ride when it's cold I insert them into oversize gloves on the back side. It helps. They are easy to carry and activate. Boil em in water for a bit after you've used em and they are ready to use again. I got mine at Dunham's for about $6. Been using them around 7 years and they still work great. 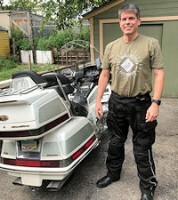 I had a set of Gerbings heated gloves that I used on my GL1100 just fine - I wouldn't use them around town, but when cruising on the highway, the bike made more than enough power to run the gloves with a little bit left over. The gloves draw 27 watts, or 2.2 amps. I followed the instructions - thanks Wingadmin. I cleaned all the calipers, had a hard time getting the seals in but managed to do it. I tried to put the pistons in but just could not do it. I am thinking of getting a big C clamp to do it. Should it be this hard to do? I lubricated it with brake fluid. Should I get new seals from Honda? No it shouldn't be that hard, and you should not need any tools other than your fingers to push them in. If you are having to use a C clamp, then something is not right. Did you clean out the grooves in which the seals sit? When I first rebuilt my GL1100 calipers, they were so filled with corrosion that they pushed the seals out and prevented me from being able to get the pistons in. I had to scrape every last bit of corrosion out in order to get the seals to sit flush enough to allow the piston to go in.